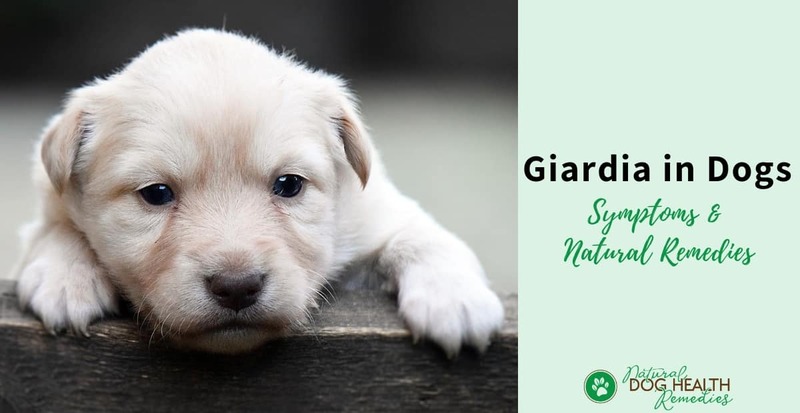 Giardiasis is an extremely common infection caused by the intestinal protozoa giardia that affects the digestive system of humans and many animals including dogs and cats worldwide. In North America, infection of Giardia in dogs has been reported at about 8%, with much higher levels in puppies (36% to 50%). Animals in shelters and kennels run a much higher risk of Giardiasis - up to 100%. People can be infected by Giardia as well. Animals tend to be more resistant to it than humans are. But if an aminal does not have a strong immune system, it cannot fight off the infection and will fall victim to the parasite as well. 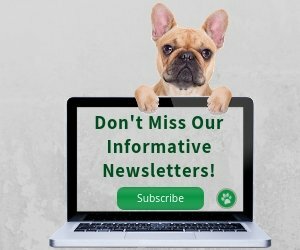 How Do Dogs Become Infected by Giardia? Dogs become infected by ingesting the giardia cysts. But how can dogs come in contact with the cysts? You may wonder. One way is from the environment. For example, if a dog drinks contaminated water with infected animal feces in which the cyst form of giardia resides, the dog will become infected. Sources of contaminated water include ponds, streams, puddles, etc. Giardia cysts may also exist in soil and grass where an infected animal has gone to the bathroom. Giardia cysts are extremely hardy - they can survive for weeks in the environment provided that it is damp and not too hot. A dog can also swallow or ingest giaria cysts by coming into contact with another dog that is infected with giardia. Once a giardia cyst is ingested by a dog, it makes its way to the dog's small intestine. There, it opens up and releases the active form of the parasite, which attaches itself to the intestinal wall and begins to reproduce by cell division. Then it will encyst itself once again and is passed outside via the dog's feces. Dogs with Giardia infestations sometimes show no symptoms at all. If they do, symptoms usually show up after 7-10 days of ingestion. Dogs who are more likely to show signs and symptoms are puppies, old dogs, those who have other intestinal parasites such as worms, and those who have compromised immune systems. abnormal stools (pale, greasy-looking, covered in mucus, bloody, bad odor). 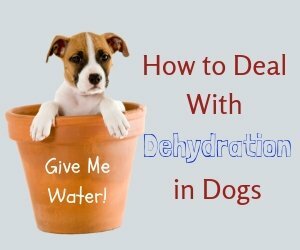 Dogs with giardia may have acute diarrhea for several days, which in serious cases, can cause dehydration. On the other hand, the diarrhea may wax and wane and become a chronic issue, making it all the more difficult to deal with and diagnose. The traditional way to diagnose Giardia in dogs has been by microscopic identification of the cysts in feces of affected dogs. However, the cysts are small and delicate and are not passed with every stool, making diagnosis very difficult. Recently, the first commercially available diagnostic test using ELISA technology designed specifically for dogs and cats has been released. The test uses just a small sample of feces and can be completed in a very short time (8 minutes), and the cost is low. Conventionally, giardia infections are treated using medications, which include Metronidazole (Flagyl), Fenbendazole, Albendazole, and Quanacrine. Metronidazole is most commonly prescribed but is only about 67% effective in dogs and can be toxic to the liver. It is also suspected to be teratogenic (it can cause physical defects in embryos) and therefore should not be used on pregnant animals. Fenbendazole seems to have fewer side effects than metronidazole. However, there have been cases in which dogs infected with Giardia have failed to respond to treatment with both metronidazole and fenbendazole. Albendazole has been shown to be effective in the treatment of Giardia but has been associated with bone marrow toxicosis. Quanacrine is effective in dogs, but the drug can cause anorexia, lethargy, and fever. As conventional medications have so many side-effects, it is much better to seek natural alternative remedies. Fortunately, there are quite a few remedies that can be used to treat this infection. 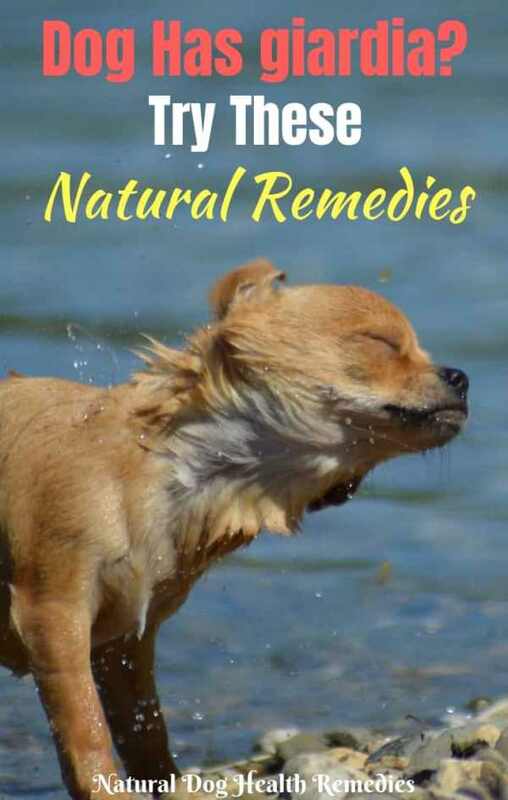 GSE is perhaps the most effective natural remedy that can be used to treat Giardia in dogs. You can use one capsule (10-15 drops of the liquid) of GSE per 10 pounds of body weight, up to 3-5 times a day, for up to 14 days. Mix the drops with food, water or a bit of veggie broth. 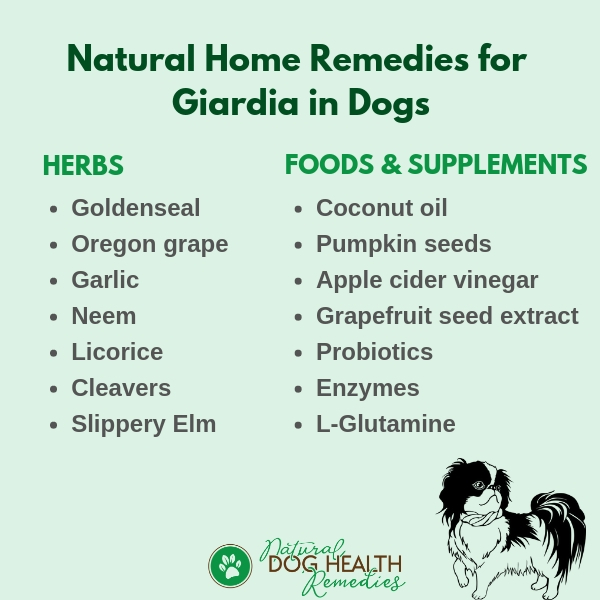 Herbs that contain the active alkaloid constituent berberine, such as Goldenseal and Oregon grape, are effective in treating Giardia infections in dogs. Berberine acts like an antibiotic, and since it is water soluble and alkaloid, it can withstand the digestive acids that destroy many other types of antibiotics in the digestive tract. Tinctures of Goldenseal or Oregon grape can be given to a dog infected with Giardia twice a day for up to 10 days. Neem is another effectiver herb due to its antiseptic, antimicrobial, and anti-protozoal properties. Other herbs that are useful include garlic, licorice and cleavers. For diarrhea caused by Giardia, the herb slippery elm is effective. Coconut Oil: Coconut is rich in lauric acid, which has strong antibacterial, anti-viral and anti-parasitic properties. 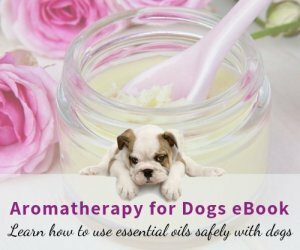 It has been found that coconut oil can help dogs (and humans) with giardia infections. Pumpkin Seeds: Studies have found that a compound in pumpkin seeds (Cucurbitacin) has anti-inflammatory, anti-parasitic, and laxative effects. Freshly-ground pumpkin seeds are often used to treat dogs with intestinal parasites, such as tapeworms and giardia. Use whole raw seeds and grind them immediately before feeding the fine meal to your dog. Apple Cider Vinegar: ACV is anti-bacterial, anti-fungal, anti-parasitic, and antiseptic. The good thing about ACV is, it supports a natural pH and doesn't upset the balance of gut flora in the digestive tract. Depending on the size of your dog, it is recommended to give one teaspoon of ACV up to three times a day. Dogs with giardia have weakened digestive systems, caused by symptoms such as diarrhea and inflammation of the mucous membranes lining the GI tract. Probiotics - to restore the balance of microflora in the dog's intestinal tract. Digestive Enzymes - to aid proper digestion and absorption of nutrients. L-Glutamine - to help protect the stomach and intestinal lining and also may prevent the formation of stomach ulcers. This formula contains the herbs licorice, slippery elm, and alfalfa, as well as supplements such as digestive enzymes, probiotics, L-Glutamine, and more. It gives advanced gastrointestinal support to dogs suffering from digestive problems caused by Giardia, inflammatory bowel disease, food allergies, and so on.